The CR16-PR NVISION Compact Router from Miranda is data router that features (16) ports. 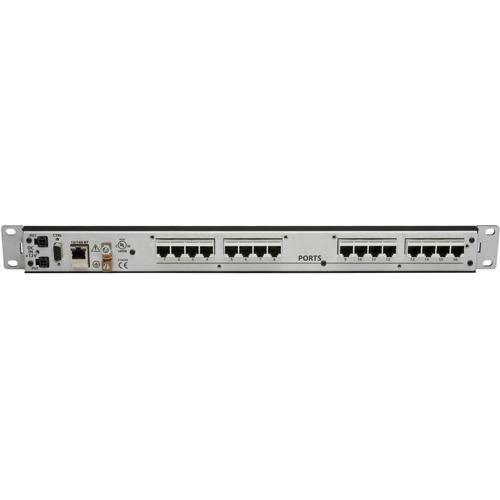 It is manages bi-directional data routing on RJ45 connectors and also features a patented dynamic port architecture. The router can be scaled by combining it with other units in the NVISION series. It is housed in a lightweight, rackmountable chassis. Its power supply is rated for over 500,000 hours of use and an optional, redundant power supply is separately available to ensure uninterrupted operation. The unit includes Compact Router System Configurator (CRSC) software to facilitate configuration of routers, including salvos and partitioning. Software also allows for programming of remote control panels and configuration of network settings. Multiple control options are available. The machine comes configured with standard Ethernet and serial ports. Separately available control panels and remote panel expansion kits may also be used. This model routes bidirectional data. It features a patented dynamic port architecture. The capacity and functionality of this unit can be extended by combining it with other units in the NVISION series of routers. A power supply with a life of approximately 500,000 hours is included, but an optional, redundant power supply can also be added to ensure uninterrupted operation. The router comes bundled with software designed to facilitate its configuration and management. It can be managed via its Ethernet or serial ports, or separately available control panels can be employed.